The weekly photo challenge is all about the close-up. Ordinarily, I am a landscape photographer looking for the grand, sweeping view. Taking close-up shots with my Samsung phone was fun and interesting. 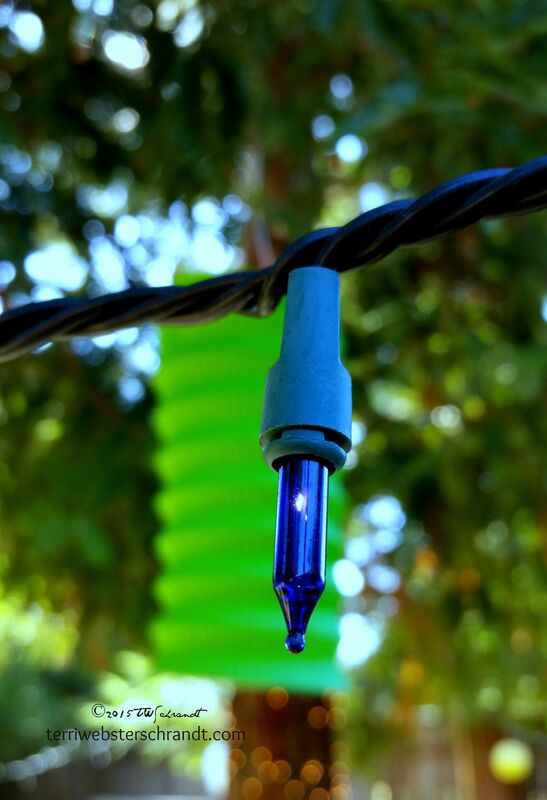 We still have party lights and festive paper lanterns hanging from our redwoods in our backyard. I hope you enjoy the Blue Light Specials today. Nice pictures. I love those lights, they’re the same as we hang on our Christmas tree. 🙂 They’re very good photos, especially for a phone. Great shots with your phone camera, Terri! Great close-ups, Terri! I love the “blue light special” 🙂 and the fact that your backyard must be an awesome place to party! I can imagine how pretty it looks at night, all lit up! Keep up the good work with the close-ups! Thanks, Lia! I will consider that a challenge! Ooooooh, Terri. That bark is seriously gorgeous. How wonderful to have redwoods in your backyard! They have gotten really big! I planted them from free seedlings given to us at the California state fair in 2001. Feels like I am in a forest! I am home. I am thinking of switching to a Pinterest Business account which I believe you have. Is there a down side? Thanks. Hi Janice, hope you had a nice vacation. I stopped by business account. It was tied to my consulting business and made it difficult to deal with my personal account. Unless you are going to sell something from Pinterest, I would use a personal account if you already have one. I have my blog and consulting boards there and they get great traffic. You should research the pros and cons though. I am so impressed with the quality of photos your phone takes! They are so three dimensional! As though if I ran my fingers over the tree-bark it would leave the smell of pine. And the colors. Just amazing..oh and choice of subject spot on. Thank you so very much JoHanna! What a lovely comment! Its the Samsung Galaxy 5S. The link to my blog. Thanks for your help.